You won’t be able to read this book and not feel touched by Bruce letting you in on his life as a father. You’ll feel Bruce’s heart in each of these essays. Fatherhood: The Journey from Man to Dad offers you concrete information about how to reach for how you want to be a father more than gives you advice on how to be a father. Whether you’re already a father, thinking about becoming one or about to be one, each essay ends with concrete suggestions that help you make the transition from Bruce’s story to your ever-evolving story. There’s nothing in this book you’ll find anywhere else. This is a must read and a gift to all men and all women. A new book for a new generation of fathers. How do today's fathers meet the challenges and changes they encounter when they become parents. In our modern-day career-driven world of 12-hour workdays, being a Father competes with nearly everything, and yet when it comes to what is truly lasting, satisfying, and ultimately fulfilling in life, there is nothing else so rewarding as being a dad. Dr. Bruce Linton, founder of the Fathers' Forum shares his experiences and insights from his "Men's Groups for New Dads." This personal, conversational, and inspirational book is a powerful call to action for every man to understand how he may change when he becomes a father. Bruce has collected here in this remarkable little book his articles, essays and blog posts that have been published over the last thirty years in magazines, books and the web. How we go from “Man to Dad” has been the theme of Bruce’s work. This is a special book for every dad from the founder of one of the first programs to address men’s changing role as parents. I am not the only writer on ‘fathers’ to have eagerly tracked Bruce Linton’s highly significant writings and activities over the past thirty years. His inspiring thinking is rooted deeply in his workshops and community activities. This work comes directly from his experience of the experience of others. He is therefore taking care of the partners, children and grandchildren of his participants just as much as he is taking care of them. This is quite an achievement and deserves widespread recognition. As the United States engages with a different kind of ‘father of the nation’, the political and cultural relevance of this book is very clear. Andrew Samuels, Professor of Analytical Psychology and Jungian Studies, University of Essex, UK. It is astonishing that there is no way to truly be ready for the most important job of all: becoming a parent. Through much trial and error I have learned that parenting is an iterative process of discovering what works to keep my family working, playing, learning, talking, and arguing, but most importantly doing these things together. Often this requires introspection and negotiation and taking a long view of what our goals are. Bruce Linton's writings and the environment of the Father's Forum have helped foster in me a mindfulness about parenting and the realization that there is no right way, but there is a good way to parent my children. I'm eternally grateful to Bruce and the other fathers I have met on this journey for the guidance and support they have provided and for the man and father I have become as a result. With thoughtful essays and deeper questions for additional self-reflection, Dr. Linton's book serves to do what his discussion groups have done so well: prepare men to become the best fathers they can be. As a mom, I can't speak highly enough of his methods or results. Direct and compassionate, Dr. Bruce Linton challenges the status quo regarding the role of fathers. Fatherhood: The Journey from Man to Dad adeptly offers men opportunities to honestly examine their values and grow into the dads they themselves might have wanted. In addition, parents maintaining their own loving relationship is essential for healthy children and Dr. Linton illustrates the how-to’s. I highly recommend this book for all parents and parents-to be. Dr. Shoshana Bennett helped pioneer the field of maternal mental health. She founded Postpartum Assistance for Mothers in 1987. She is the author of Postpartum Depression for Dummies. Dr. Bruce Linton's deep insight into mens' transitions into fatherhood illuminates these valuable essays. His compassion and keen perception were a great benefit to me during my years in the Father's Forum discussions, and I am delighted that many others as well can now benefit from his wisdom in book form. As fathers, we look to the dads a few stages ahead of us as we equip ourselves to be the parents our children need on any given day. 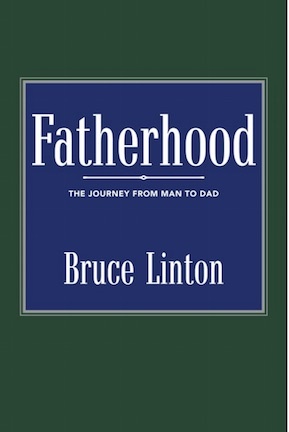 Dr. Linton's book gives us a window into the trials, tribulations, and triumphs of the hundreds of dads he has connected with over the last thirty years. Dads (and Moms) will benefit immensely by learning from these parents that have come before us.